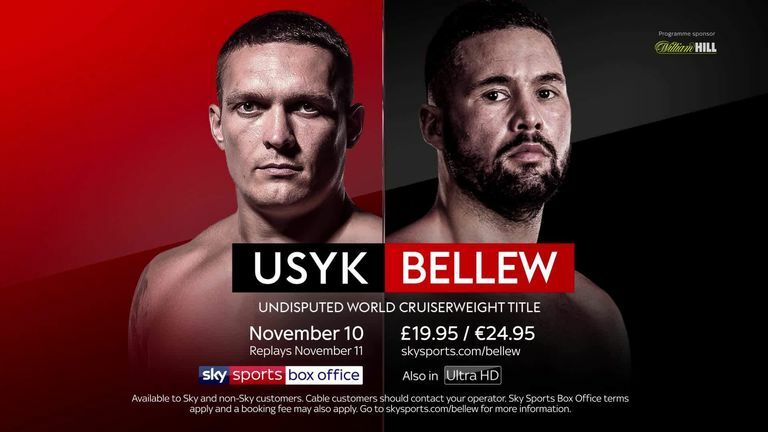 The countdown is on to the undisputed cruiserweight clash between Oleksandr Usyk and Tony Bellew on Sky Sports Box Office. Tony Bellew will take on unbeaten and record-breaking cruiserweight king Oleksandr Usyk. All four recognised titles are on the line, so here is all the information on booking and watching the Manchester Arena event. Oleksandr Usyk vs Tony Bellew (IBF, WBA, WBC, WBO world middleweight titles) will take place at the Manchester Arena, Manchester. Anthony Crolla v Daud Yordan (12 Rnds Lightweight), Ricky Burns v Scott Cardle (10 Rnds Lightweight), David Allen v Ariel Esteban Bracamonte (10 Rnds Heavyweight), Josh Kelly v Walter Fabian Castillo (Welterweight), Sam Hyde v Richar Riakporhe (10 Rnds Cruiserweight) and more, are on the undercard. The event will start at 6pm on Saturday, November 10, on Sky Sports Box Office (Sky channel 491) and Sky Sports Box Office HD (Sky channel 492), until 1am Sunday, November 11. The event is priced at £19.95 for UK customers, €24.95 for Republic of Ireland customers, up until midnight, Friday, November 9. Thereafter £19.95 / €24.95 (ROI) across all "self-service" bookings (remote control / online) and £24.95 / €29.95 (ROI) if booked via the phone (either IVR or agent), but note an additional £2 booking fee if via an agent still applies. The event price will revert back to £19.95 / €24.95 (ROI) from 1.00am, Sunday, November 11. Two repeat showings (full duration) will be shown at 9am and 4pm on Sunday, November 11. Go to Channel 491 and press the green button to go to Sky Sports Box Office Sports and Events. Use the arrow buttons to highlight the event. Press select, and the buy screen will be displayed. Press select to confirm your order. Enter your pin if prompted. From Saturday, November 3, no matter what channel you are on, press Box Office, select Sports and Events. Use the arrow buttons to highlight the event. Press select, and the buy screen will be displayed. Press select to confirm your order. Enter your pin if prompted. Select 'Sport' on your menu, and then select 'Box Office' within the sport menu at the bottom of 5/6 options. For UHD customers, the live event only will available in UHD. You can book and stream the fight whether you're a Sky customer or not - it's your choice to watch via our dedicated website, via the Sky Sports Box Office app on your mobile or tablet devices, or via your NOW TV box or Smart Stick. First, visit skysports.com/boxofficelive to book and pay. Then on fight night itself, you can either sign in to watch on the same website; download the Sky Sports Box Office App and log in to watch there; or access the stream on your NOW TV box or your NOW TV Smart Stick. Read our FAQs for all you need to know about Sky Sports Box Office Streaming, and how to book. To order the event, call 03442 410888 (0818 220 225 from ROI) (there may be a £2 booking fee for telephone bookings). There is a £5/€5 surcharge for bookings made via the phone from midnight, Friday, November 9, to 1.00am, Sunday, November 11.